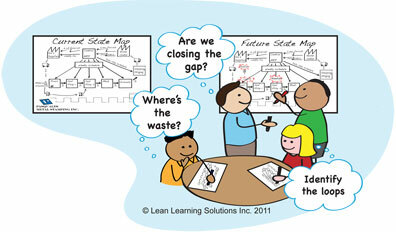 Once again last week I came across an organization with a value stream map hanging on their conference room wall. What’s the big surprise with this? In fact it’s no big surprise at all as I often see this happen. Teams do a wonderful job of mapping their Current State and identifying different sources of waste and various kaizen they are planning on doing to eliminate it. This team had even added a timeline and calculated a leadtime for their value stream which is something I don’t usually see. I could see their Current State map but I couldn’t see their Future State map nor what business gap they were trying to close. A Future State is driven by a business need and that need comes from the organization’s strategy. The strategy says what objectives we need to achieve as a business and outlines at a high level how we are going to achieve it. Often the strategy goes on to say what we’re not going to do to meet the business needs or targets and quite frankly this is another often overlooked step but that’s the subject of another blog. The Value Stream takes this strategy and develops the tactics describing what the value stream needs to improve to meet the business objectives of the organization. There is a direct link between the kaizen and the improvements the value stream is making and the business objectives it needs to deliver to the organization. This link means a testable hypothesis is formed “If we do this, then we will get that”. It’s a simple binary test that can be checked at every review session. This is a very different approach from the one that says – map the current state, identify waste, drive improvement and remove waste and see what results we achieve. This approach doesn’t set up a hypothesis, doesn’t use the scientific method and although it can lead to some improved business results, doesn’t stretch us to experiment, try new things and learn rapidly, all of which are required parts of a lean system. 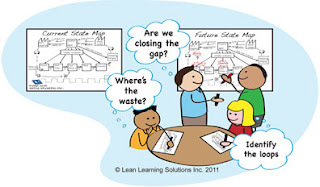 What I’d wish I’d seen in the organization I visited last week, was a Current State map, a clear business target with gap identified, a Future State map and a plan on how to close the gap. Does the Future State close the gap to the business objective? Does the plan close the gap to the Future State? By following the PDCA cyle and doing a Check/ Adjust against these questions, organizations can learn a great deal and accelerate their improvement efforts. More importantly, the improvements are driven by a business need rather than being random acts of improvement.